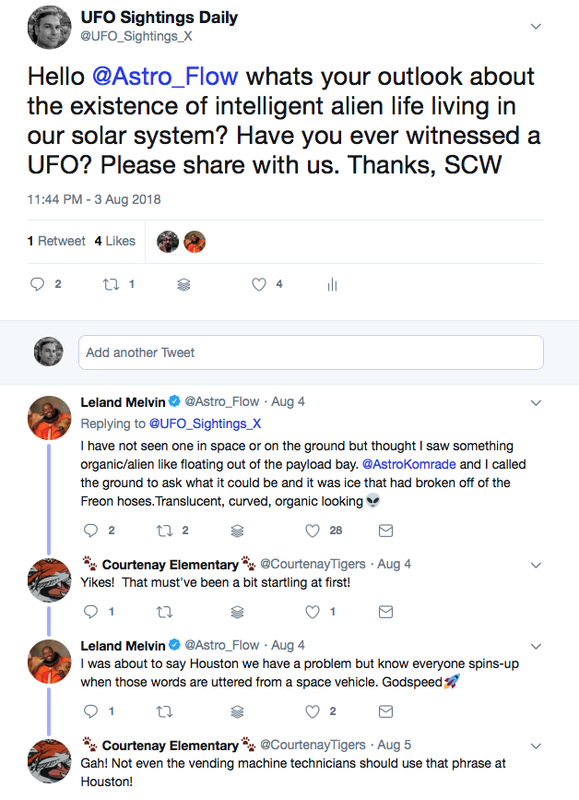 UFO SIGHTINGS DAILY: Updated: Astronaut Leland Melvin Told Me Today He Saw Something Organic And Alien Like In Space, UFO Sighting News. Updated: Astronaut Leland Melvin Told Me Today He Saw Something Organic And Alien Like In Space, UFO Sighting News. 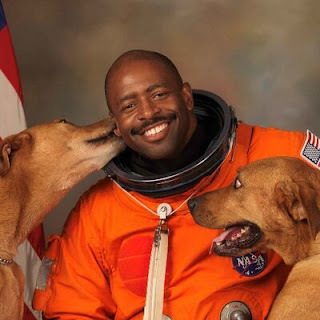 I wrote to astronaut Leland Melvin. He served on board the Space Shuttle Atlantis as a mission specialist on STS-122, and as mission specialist 1 on STS-129. This led me to wonder...if the shuttle is in a low earths orbit at 400 miles above the earth, why would he trust the opinion of someone who was not there to see it? This was baffling to me. So I tweeted to him again. Replying to @Astro_Flow @AstroKomrade Hey thanks for answering. Wow! I think ethics would say that your opinion of it being organic is more reliable than the opinion of someone on ground control over 400 miles away. Is it possible they lied and called it ice to calm you down and make u focus on the shuttle? As of yet, I have not received a response...but still this is bewildering to me. He said "he I saw something organic/alien like floating out of the payload bay." And yet, he doesnt trust his own opinion of what he saw? Ice does not look organic...so it sounds like he saw alien life floating past while in space...but was it intelligent? Or just a creature living in space like a fish lives in water? I will update you on his response as soon as it comes it. Hopefully he wont delete his tweets. Astronaut Leland Melvin answered me and it sounds like he may have doubts about NASAs ground control explanation as well. Its obvious to me that he knows what he saw up there with his own eyes. That it was a jellyfish type of alien creature...one of many that live in space, but NASA doesn't want the public to know. Do you remember when Russian astronauts on the International Space Station were cleaning the outside of the ship, when they found 2-3cm long plankton growing healthily on the solar panels? They took samples and had no explanation how they got there or how they lived. That itself was alien life.